How about having my family send a package to me from the Philippines. I am dreaming now of the good old days, eating the biggest share of Toblerone I could possibly have in the presence of my siblings. But that’s not far from reality; only now, I prefer kornik and polvoron over imported sweets. So while I’m dreaming of pasalubong, I thought of finding ways on how Filipinos in the Philippines can send through courier services to OFWs in Canada. I want to add reviews whenever possible. But I don’t mind learning your experiences with any of the courier services found on the list. All the courier services in the Philippines with international shipping have online tracking service and rate calculator. So it’s only a matter of choosing the courier company that fits your need. 2GO Express is the sole retail partner of FedEx in the Philipines. Click here to find out the 2GO International Rates. I’m about to send a package in the Philippines through DHL. What I like about its website other than the tracking service is that you can get an online quote. Enter the package information (size, weight, etc.) and you can find out how much to pay for the international shipping. What comes to your mind when you think of FedEx? Mine are the vivid moments shared by Wilson and Tom Hanks in the movie Cast Away. Watch it if you haven’t seen it; otherwise, watch it again. But I’m not writing a movie review; I’m trying hard not to. Going back to the business of courier service, FedEx just like DHL, allows you to get shipping rates from Philippines to Canada or anywhere. The downside is you have to log in. JRS is one of the local courier companies in the Philippines that we are all familiar of. When using the rate calculator to find out the shipping rate, use grams instead of kilograms, which is the common weight by courier services in the Philippines. For sending documents within Canada, I rely on UPS to make sure the package arrive on time. With peace of mind, comes a bit of a higher fee compare to Canada Post. In the Philippines, UPS might be less known compare to other courier services. (I’m saying it thinking of my pre-departure days.) UPS also has a way to calculate time and cost. I’m curious to know the feedback of Filipinos in the Philippines about UPS, so share it on the comment. UPS Delbros International Express Ltd., Inc.
UPS has many dropoff locations such as the authorised shipping outlet and UPS Alliance locations. There has to be a close outlet near your place. The eCommerce in the Philippines keeps on growing. I’m glad to know that more Filipinos are working from home as a freelancer or entrepreneur. For those with online business, Xend has become a courier service of choice especially for domestic shipping. Dropoff locations are more accessible in 7/11 and 2GO branches. The rates are based on the shipment’s destination regardless of the pick-up location. The international shipping is coursed through UPS, Singapore Post, or Philpost. Having many choices helps us to save. 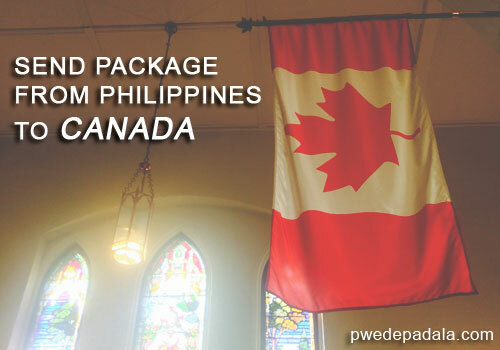 So before you send package from Philippines to Canada or other country, check the rates. If you and the recipient are not in a hurry, choose the standard shipping rate; although it may take the shipment to arrive within several days. And don’t forget to avail a free insurance; otherwise, it’s probably best to skip the insurance fee depending on the worth of the package. Which of the courier service in the Philippines you can recommend? If it’s not on the list, let us know. Hi mga kabayan, my cousin in Manila bought 2 parols: 1 medium and 1 large. DHL was charging him 15K pesos to ship to Toronto. Does anyone know a cheaper courier? Hi! I need to send my hubby’s phone from the Philippines to Canada, can you help me of what trusted courier I can use to send it. Lots of important things are in his phone for his work so I need to send it with peace of mind that it will arrive to him without any damage. Hi Julie. I can’t recommend any courier since I haven’t done this before and would never dare anyway. For the files, why not back up the information in the cloud (eg. icloud for iPhone). It’s much safer this way without a cost. You can also back up the contact numbers, messages, notes etc. Hope you can give us an update. Can you send food to Canada from the Philippines? If yes, what courier would take it? Yeah I agree. Dhl worst company. I waited my parcel for 2 weeks it was noted on their data delivery attempted but no one’s at home. Which I’m at home on the day I scheduled for delivery I’ve waited all day and keeps on calling costumer service even team leader promise to do a return call to me but waited for nothing. Took me 3 consecutive days on calling them but nothing’s happened. It ended up I picked up my parcel by myself. DHL. The worst service ever. I seriously like to warn everybodey NOT to trust DHL’s customer Service! They lost not only two of my shipments within 7 months, to and from Philippines/Canada, but the worst is that they simply do NOT keep promises to call me back for infos and updates over lost items. Not even the supervisor! After 5 weeks they simply said they consider the parcel lost… “here is the claim form”. What an utter nightmare!!! Because of this I had 2/3 of my pension put on hold for 6 months, and the cell phone pauments continue for another year w/o the phone. It’s like a horror story Peter. It’s a nightmare that nobody wants to endure. As for me, fortunately, I never had a problem with DHL for small parcels and documents. It’s pricey but everything arrived where it is supposed to within a week or less. Canada Post offers the lowest cost for small parcels. Jet Worldwide Canada offers great service to the Philippines from Canada. They partner with DHL and can provide a Canadian address for Filipino’s who need a local address. Hi Timothy. Thanks for the information. I’ve checked the website and searched for some important information. It would help Filipinos to reach out to Jet Worldwide Canada if there’s a contact information of the main office and branches in Canada. Lastly, I would appreciate if you could lead me to the page regarding the Canadian address for Filipinos. Hey I’m looking to send a small package (2 plastic bags worth of snacks) from Manila to Vancouver. How did the send through DHL turn out? My siblings received the package that I’ve sent through DHL from Canada to the Philippines. It contains gadgets and documents. My sister was able to send documents in Canada. All in all, we have no complain about DHL except that the shipping fee is expensive but the service is fast and reliable. We had peace of mind which is priceless so it’s all worth it.